Our first distillery tour of this trip. Through the festival, we scored four of the ten tickets available. 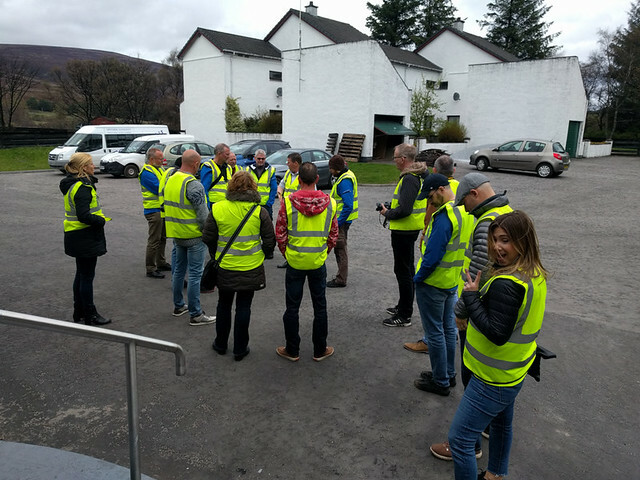 Unfortunately for us, four extra people were added to our tour group that also included a large group of Dutch that had clearly enjoyed a few tastings already… The larger group size was disappointing as it made it harder to hear and interact on the tour. 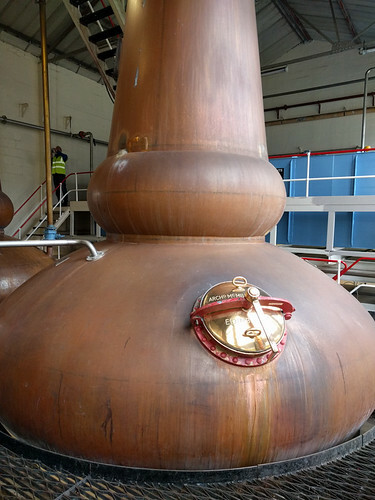 Tomintoul’s facility is quite large with millions of liters of spirit output per year. 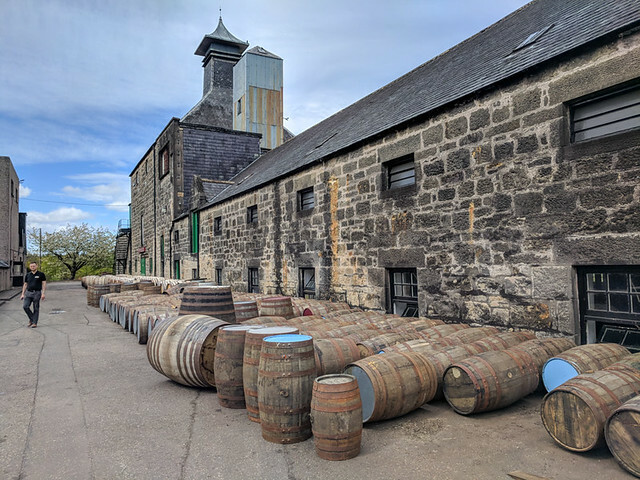 12 yr – fave! Nice sugar waffle, a little raisin. 16 yr- some astringent, less sugar flavorful, not as enjoyable as 12. 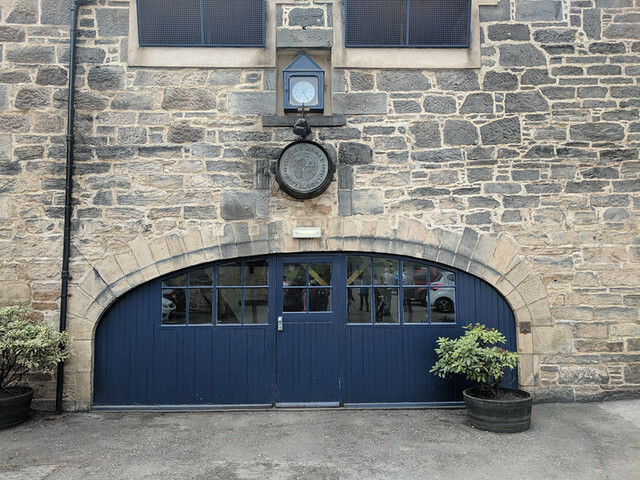 The tour here was significantly better than Tomintoul, and really the best distillery tour we’ve experienced so far. 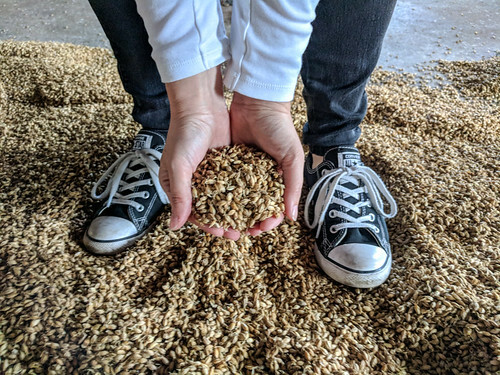 Our hosts were great, providing lots of information on the distilleries revival and operations – for example, they’ve moved to Concerto barley (a common refrain on this trip). 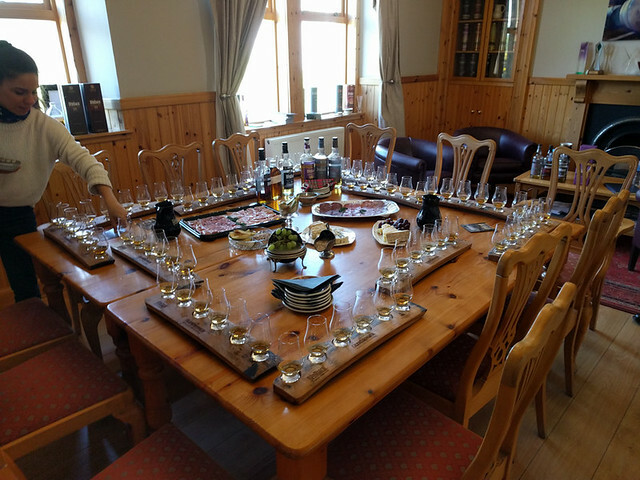 They also encouraged us to pair the whiskies with a selection of meats and cheeses from the Spey Larder. one of the samples wasn’t even bottled yet! 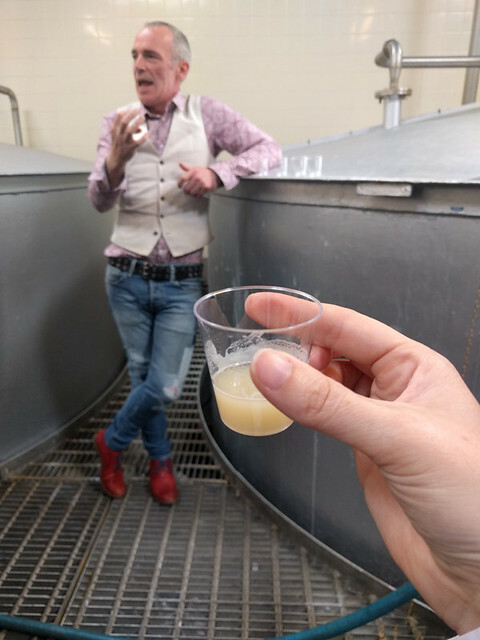 The distillery operations were interesting, and we got to taste the fresh ‘beer’ which was a bit sour, plus fresh spirit that was surprisingly good and appley. 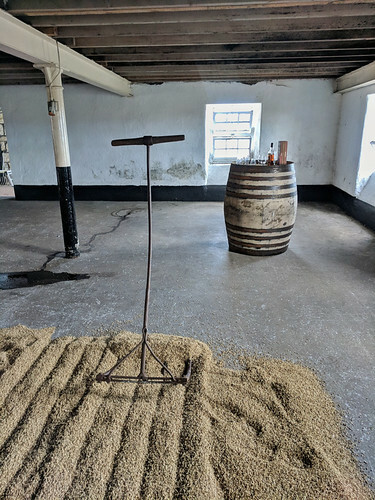 One of the unique features of Benriach is their active malting floor. 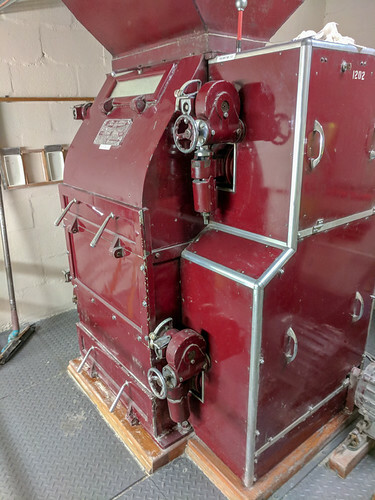 Though they only use it for special batches due to the extra costs, it was quite interesting to see the manual ‘old way’ of doing things. 10yr – Three woods (sherry, bourbon, virgin), flavors of vanilla, cream, light orange – creamsicle! A little apple, a little pineapple and coconut too, with spice on finish. 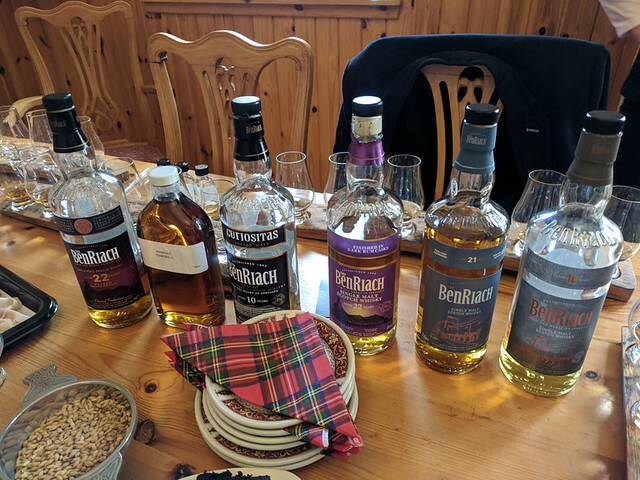 Would be a good introduction to whisky for most people. The apple juice flavor became more pronounced as the whisky sat. 21yr – Same three woods plus a little red wine barrel. Wood and tannic on finish, dry. Big mouth feel! Little more cream with water, more fruit too. Tingle on finish. 22yr – 9 yrs on rum barrel. Definitely rummy, nose and palate. Some oak, brown sugar and toffee. A little spicy in finish. Not my fave. 10yr Curiositas – Bourbon barrel. Nice mid-range peatiness, we’ve always enjoyed this one. 21yr Temporis – To be released soon, a mix of two sherry barrels, bourbon, and virgin oak. Lovely big smoke, nice cherry too. Spicy and tangy on finish. 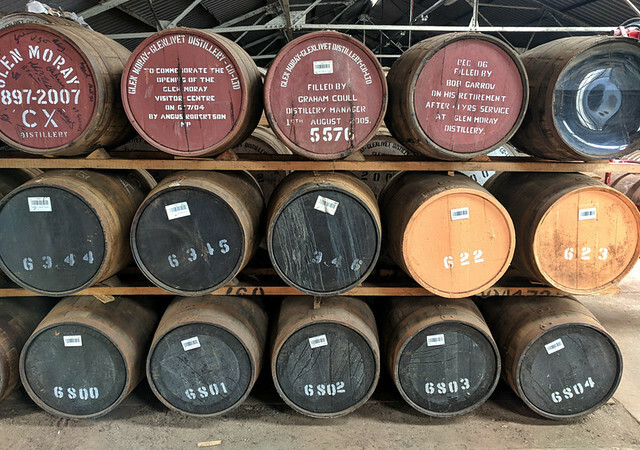 22yr – 9yr on px Sherry cask. Very smooth, medium smoke with a long lingering finish. A fairly quick tour, but this was our third of the trip and the least expensive at £5 so that was okay with us. 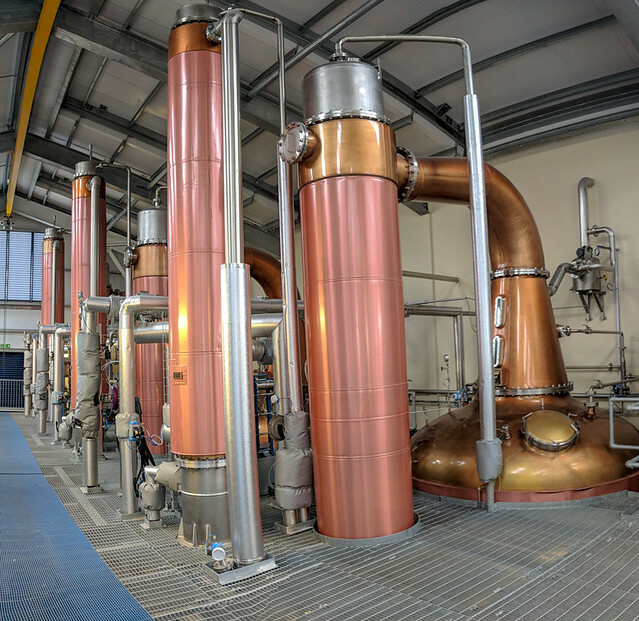 Interesting layout to facility, with triple distilling columns. 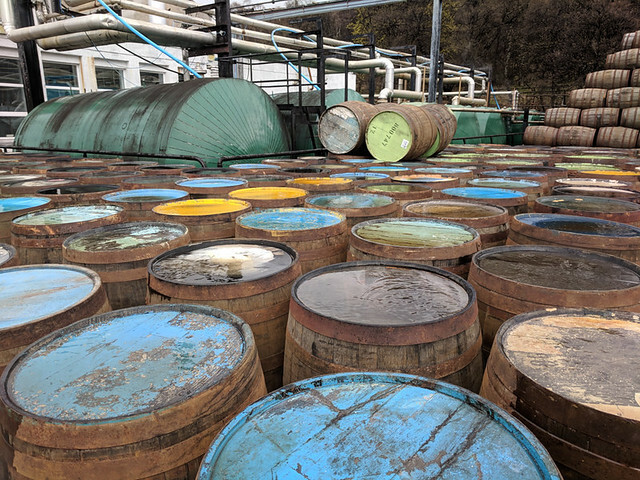 The highlight of our tour was visiting the cask warehouse and smelling the dozen individual casks, with interesting differences between them. 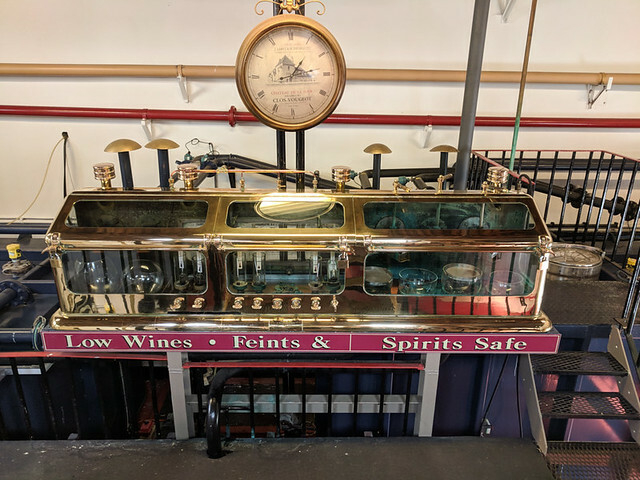 The tour ended a bit abruptly in the shop as we were simply left to sample our pre-measured whiskeys from trays. Leandra mentioned that she was driving and our tour guide returned with a set of four plastic bottles, a funnel and labels. Score! Our guide also allowed me a sample of the one peated whisky they had after Leandra requested it for me. 12yr – Bourbon only. Chill filtered. Some oak and cream, but feels a bit watery and too light for our taste. 15yr – Bourbon and Sherry. Chill filtered. Quite bland, didn’t like. 18yr – Bourbon cask, non chill filtered. More intense, a tingly kick on the end. A little orange. Opens with a little water. More oak and vanilla too, the best of the bunch. 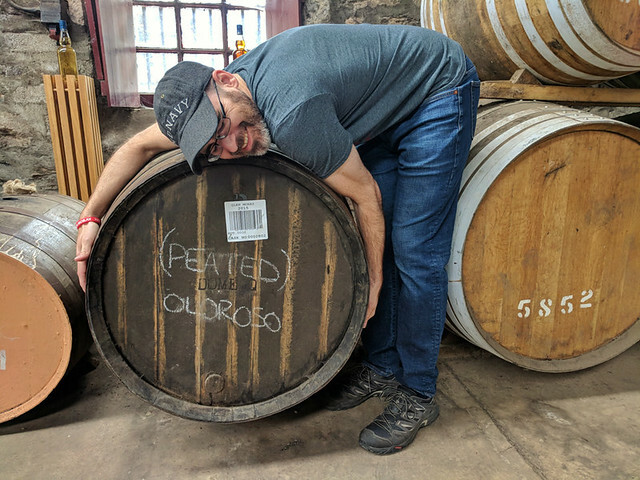 Peated – quite light, 75% peating, not enough kick, feels watered down again. A little banana and cocoa. Probably better as a mixer.